The Smithsonian is famous for its distinguished and beloved museums. 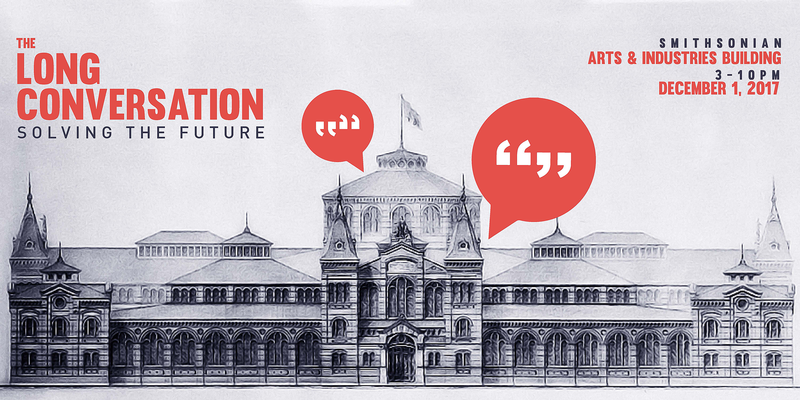 On Friday, Dec. 1, the Smithsonian’s Arts and Industries Building will be the scene of a radically different Smithsonian experience—a lively eight-hour conversation with leaders, innovators and luminaries discussing one question: What makes you optimistic about the future? The program begins with a short conversation (2–3 p.m.) among Smithsonian leaders, who will announce “Smithsonian 2022”—a five-year plan for expanding the Institution’s reach, relevance and impact leading up to its 175th anniversary. Smithsonian Secretary David Skorton will be joined by philanthropist and chair of the Smithsonian’s Board of Regents David Rubenstein, the Sant Director of the National Museum of Natural History Kirk Johnson and Smithsonian Regent U.S. Rep. Doris Matsui. They will set the stage for “The Long Conversation” program, which will run from 3 to 10 p.m. and include a pop-up bar and café by local chefs Jose Andres and Eric Bruner-Yang, as well as several immersive art/tech installations and even a docent robot to help welcome and engage visitors. Among the more than 25 speakers are musician Yo-Yo Ma; Washington Mayor Muriel Bowser; Frank Foer, writer for The Atlantic; Director of Harvard’s Center for the Environment Daniel Schrag; neuroscientist Cori Lathan; Latinx comic-book writer Gabby Rivera; and Sabrina Gonzalez Pasterski, a 24-year-old Cuban American theoretical physicist whom Harvard calls “the next Einstein.” A full list of speakers and a live webcast are available on The Long Conversation website. Admission is free, but seating is limited; reservations, in two-hour sessions, are recommended. The Long Conversation is an experimental conversational format originated by the Artangel Longplayer project in London in 2005 and brought to the U.S. by the Long Now Foundation in San Francisco. It is a relay of short, unmoderated, two-person dialogues, unified by a common question. For this event, conversationalists bring one idea that makes them optimistic about the future—a trend, an experience, an innovation, a technological breakthrough, a movement. It starts with two people on stage, and every 15 minutes one person leaves and another comes on. Each person is on stage for a total of 30 minutes and has two 15-minute conversations with two people from different backgrounds about their ideas. Among the goals of the Smithsonian 2022 plan: catalyze new conversations and address complex challenges through research and education; reach 1 billion people a year with a digital-first strategy; and amplify the power of the stories told by bringing together the breadth and diversity of the Smithsonian. The Long Conversation concludes the first week of the annual American Ingenuity Festival sponsored by Smithsonian magazine. The Long Conversation event will be in the Arts and Industries Building, the second-oldest Smithsonian building. It opened in 1881 as the U.S. National Museum and was the scene of President James Garfield’s inaugural ball that same year. The building was completely renovated for the 1976 Bicentennial when it housed an exhibition filled with artifacts from the Centennial celebration in 1876 in Philadelphia. The building closed for renovations more than a decade ago and is now open for temporary exhibitions and special programs.